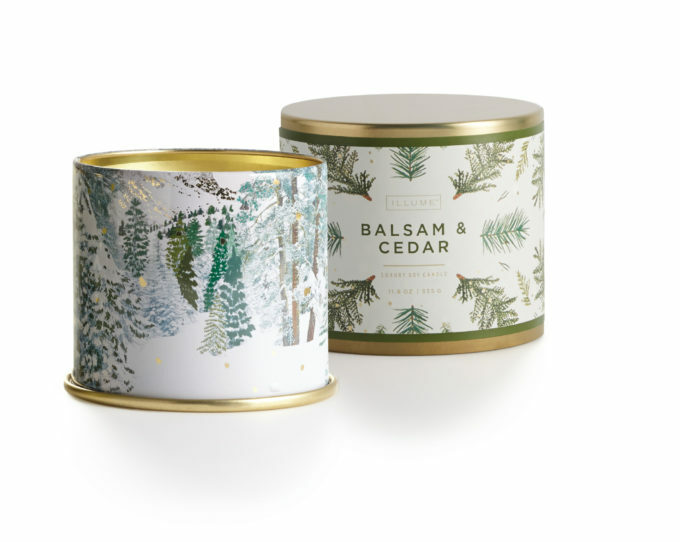 Nothing ushers in the season of giving like the Balsam & Cedar candle by Illume. A well-crafted tradition and almost cult classic, this quintessential fragrance envelops you in an enchanted winter forest as timely as it is timeless. Balsam and oak moss mingle with aromatic cedar wood, cinnamon and eucalyptus for the ultimate yuletide moment. Crafted from exclusive vegetable soy and paraffin wax blend with a cotton wick. The size of this favorite was increased by 39% from 8.5 to 11.8 ounces AT THE SAME PRICE AS LAST YEAR! We shop the candle market every year for THE BEST Holiday scent and this candle by Illume wins every year. Our supplies are always limited, and when sold out there are no more until the next year, so.. enjoy! New last year, we no longer burn the candles in our shop! We use a candle warmer from Candle Warmers, Etc., “the original alternative to lighting a candle.” No more open flame, and the candle melts evenly to release all of its scent – no more wasted wax once the wick burns down. Using a warmer is simple, and the candle reconstitutes itself when the warmer shuts off, ready for the next use. Choose either the 8-hour auto shut off, or the manual style. Excellent item fast shipping too!